A few months since launching a video streaming feature for celebrities, Facebook is currently setting out to let regular users to broadcast footage of themselves live to their friends. The new feature primarily mirrors the experience offered by Twitter-owned periscope and also the startup Meerkat: Facebook users can write a bit description then launch a broadcast where they will read comments from viewers and see how many folks are looking right away. Facebook also makes it simple for users to save their videos to their timelines. Users can access the feature from the main Facebook app, by tapping on the status update button and choosing a special icon. For now, it's solely offered to small percentage of iPhone users, as Facebook tests the feature for broader roll-out. Live videos align with Facebook's efforts to makes its content more time sensitive, so folks have incentive to see their feeds at specific times rather than simply when they are bored. 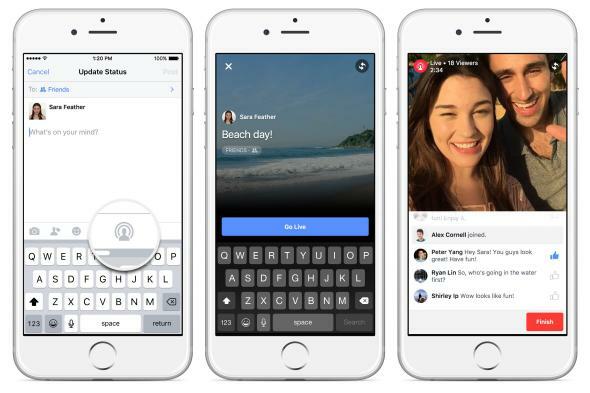 in that vein, Facebook released remotely-accessible "Place Tips" earlier this year to encourage users check up on live, curated content from events.